3 large sized buttons for easy use with gloves that give access to functions ON/OFF, Zoom x2 x4, Colouring modes, Still image, Picture shooting, Video recording, Picture gallery, Laser pointer, etc. 3 colouring modes as standard: Fire, Search and Inverse + 2 optional colouring modes: Cold and Multicolour. LiFePO4 batteries (Lithium Iron Phosphate) are very different from Lithium Ion batteries. They are more resistant to high temperatures (no emission of gas up to 140°C, no explosion). Effective and versatile thanks to its 3 action buttons, and equipped with a large 4'' screen, Leader TIC 4.3 thermal imaging camera is particularly suitable for indoor fire attacks. Combined with its compact size (950 g), this TIC has all the important features for fire operations (5 colouring modes, Video recording, Photo shooting, Laser pointer, Zoom, etc.) It incorporates an ultra-sensitive infrared sensor (17μ Silicon Amorphous aSi 384 x 288), a germanium window to protect the internal electronics and a wide-angle lens (H 51° V 40°). 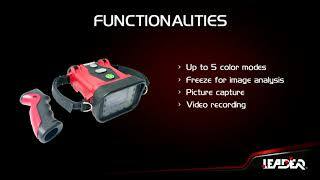 Leader TIC 4.3 thermal imaging camera has the status of a fire attack camera and is ideal for fire operations, search for missing persons and areas on fire. Also, an optional wireless transmission kit can be plugged for live image streaming on 3 digital supports (mobile, tablet, computer) at the same time! This is useful for training purpose or special ops.